My beloved friend President Gordon B. Hinckley said, “When you walk with gratitude, you do not walk with arrogance and conceit and egotism, you walk with a spirit of thanksgiving that is becoming to you and will bless your lives. Seeing as how I'm starting to feel a little bovine like, something a little becoming would probably do me good. But I'm 99.8% sure it will become annoying around day 16. So I won't be at all offended if you delete ryanandalissapacker.blogspot.com from your reader and add us back December 1st. On most Mondays we dine at Bajio, as I am scrambling to find something for dinner after coming home from work. But today I broke out the Crock-Pot and a warm, inexpensive, homemade meal awaited us. It wasn't anything gourmet, but it was pretty good. And it was ready when I got home. Thank you Crock-Pot. I am excited to try this. 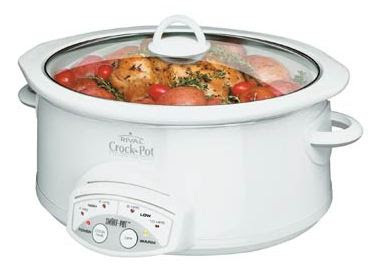 We use our crockpot almost every Monday and need to start doing it on Wednesdays, too, because of after school lessons. Love the idea of the 30 days of thanks. Keep them coming!